Six Seconds and the Bay Area EQ Conference invite you to attend the 3rd annual EQ conference to be held on May 18, 2019 in Redwood City. 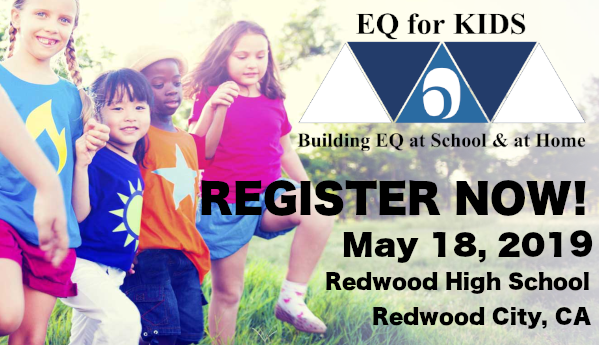 The theme of this year’s conference is EQ for KIDS: Building EQ at School and at Home, bringing together teachers and parents to learn how to support the development of EQ skills in their students and children. It’s informational and FUN! The need to equip children with the skills to manage their emotions, relationships, and life is great. Join us in facilitating discussions, activities, and learning strategies for helping kids build their EQ skills! Coffee, tea, sweets and a boxed lunch will be included. Limited space available. Register now to reserve your spot! Ten scholarships are available to attend the conference free of charge. Please contact [email protected] to inquire further!